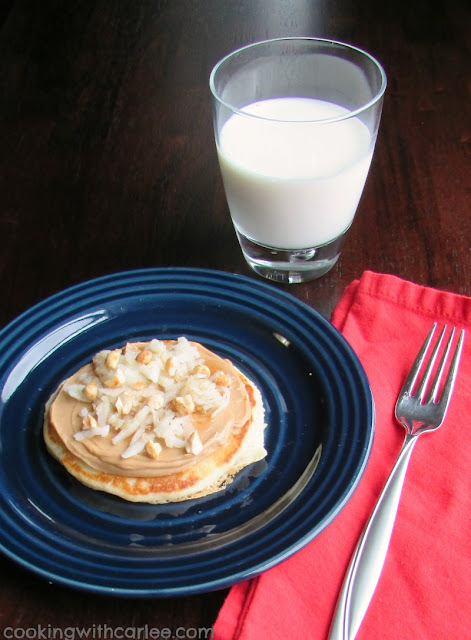 A perfect breakfast or fun snack, these peanut butter apple pancake pizzas will leave you with a smile on your face every time! I don't know about you, but around here it seems that life just keeps getting busier by the minute. Of course one of the most hectic times of day is the morning. Getting everyone up and dressed and out the door on time is a challenge under even the best of circumstances. Making sure we've had a nutritious breakfast before we go just adds to the stress. But as with all things busy, the best way to tackle the problem is with a game plan! First things first, mornings go faster when there isn't an argument. So, picking breakfast staples that the kids are going love but you agree with is a number one priority. That's where these Peanut Butter Apple Pancake Pizzas come in. They are delicious, nutritious and fun to eat! Not to mention you can make a whole stack of pancakes on the weekend and put the extras in the fridge to use during the week. It makes breakfast ready in and instant and puts a smile on the kiddos faces. It doesn't get much better than that! These wholesome gems come together with just a few ingredients. 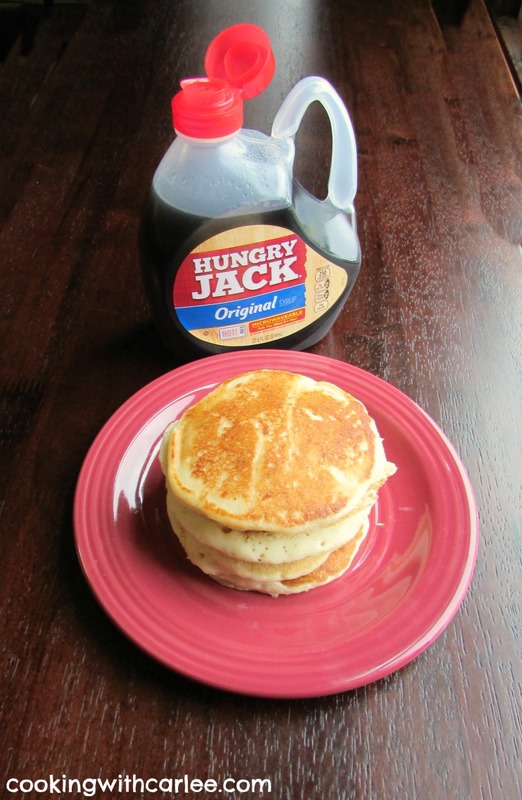 Hungry Jack® Pancake & Waffle Mix is a great place to start. I makes delicious, hearty pancakes in a matter of minutes and all you need is water and a pan! The next part is my new favorite. Peanut butter with maple flavor built right in. You read that right! Jif® Flavored Spreads has new spreads with naturally flavored maple or cinnamon built right in. They have no artificial ingredients, are gluten free and non-GMO too! Either flavor would work great for these but I chose the maple variety and you should just smell how good it smells when you open the lid. Of course you need some syrup if you are going to have pancakes. Hungry Jack® Syrup has the perfect bottle that can be warmed in the microwave. See, we're all about ease here! An apple or two and some chopped nuts and a hearty breakfast pizza is born. Make a couple of batches of pancakes on Saturday morning and sit the family down to a nice breakfast together. Put the extra pancakes in the refrigerator and pull one or two out for a quick weekday breakfast. Spread a little maple peanut butter on, throw in some slices of apple and hit the door. Fold it like a taco or eat it like a pizza. It is grab-n-go and practically mess free! See, mornings are going to be a breeze! I thought it would be fun to grate some apple to make it look like cheese on the pizza. They really did look great. Of course you could save yourself some time and chop or slice them instead. No matter how you decide to cut your apple, these are sure to be a hit. My little guy thought it was so much fun to eat his little pizza. I'm not going to lie, I thought it was a lot of fun too! Make the pancakes according to the package directions. I made mine about 4 oz each, but a plate sized pizza would be fun for bigger kids! I found the apples grated easiest for me if I pealed them first. I also did some unpeeled and chopped. Both tasted great, but the grated apples looked more like cheese on a pizza! Warm up your Hungry Jack Syrup and drizzle over the apples. Sit back and watch the smiles! We have always spread peanut butter onto of our pancakes and topping them with fresh fruit is always a win. It's a great way to turn them into a full meal. Thanks, Candy! 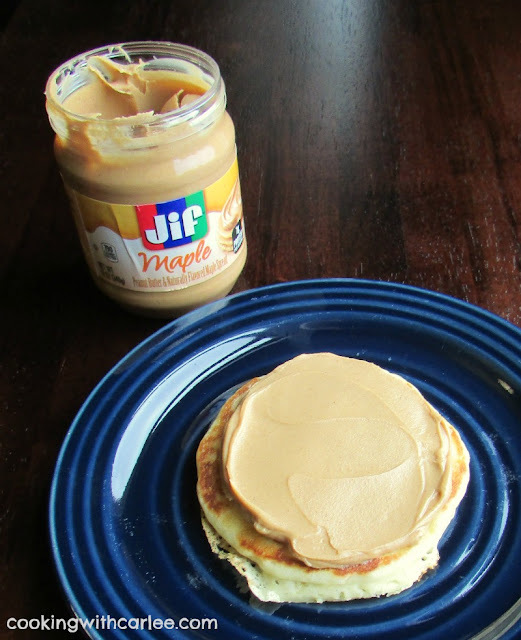 Maple peanut butter-genius. We have enjoyed our pancakes with peanut butter, honey and bananas for years. We also enjoy dipping our apples in peanut butter. This takes our favorites to a whole new level. This is what's for breakfast this weekend. Isn't that smart? I used to melt peanut butter and maple together occasionally for waffles. Now I don't have to go through the added step! The flavors work so well together. I hope you enjoy them! This looks delicious! 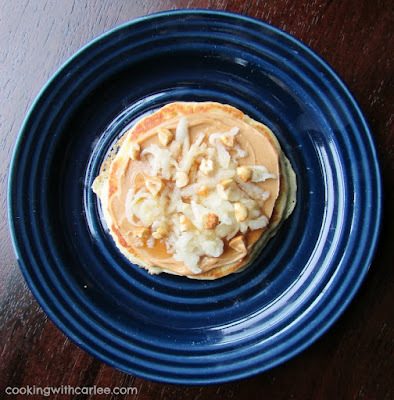 I have never had peanut butter on my pancakes, but I bet it is delish! You'll have to give it a try! Especially with the maple added, it's like it was meant to be! Looks really good! I'll definitely have to try this soon! Thank you! They were a big hit here. I hope you love them too! Now that is a fun treat! Thank you! They are quick, easy and great for those busy mornings. Folded in half, my little guy can eat one on the run! Thanks, Bella! It is definitely a delicious way to start the day! What a cute idea Carlee! I didn't even know there was a maple flavor so I'm glad you highlighted it here! Thanks, Mollie! Isn't that genius? I love peanut butter and maple together! Wow - these look fabulous... especially with peanut butter! Never tried that - pinned for later! Thanks, Clare! I just think these flavors are meant to go together and this is an extra fun way to serve them. I hope you give them a try! 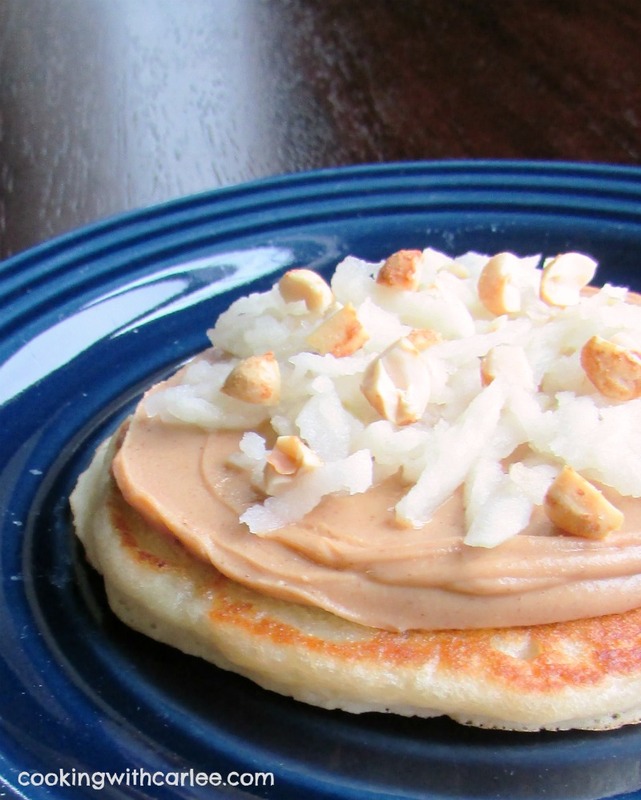 I've never added PB to pancakes but just might give it a try now! It is a great topping for pancakes! I think it helps you feel full longer too. I hope you love it! These pancakes look so delicious! Thanks for sharing! Thanks, Emily! They were definitely a hit! Thank you, Cathy! We had so much fun making and eating them. Now my little dude wants pancake pizzas for breakfast at least a couple of times a week! What a unique take on pancakes! These look absolutely delicious! I can't wait to give them a try! Thanks, Ashley! They are a lot of fun and super delicious! My mouth is watering and I'm wondering why I never thought of this before! Delicious and awesome idea. Ha! Thanks, Hannah! I hope you give them a try! I had no idea that peanut butter came flavored with maple or cinnamon. I am definitely going to check that out! Love your shopping diagram, wish I had that for my whole list! I'll definitely make you one, you'd just have to shop at one of my two normal stores. Anywhere else and I wander like a lost puppy. Wandering can get expensive too! ;-) Thank you! Love the combo of flavors you used Carlee! Thanks, Jenna! It all was delicious together! Hello Carlee, you pancakes look so good and yummy. Thanks for sharing this recipe to make them and I pinned! My husband is the same way ;-) What I call a food makes all the difference as to whether or not he likes it! 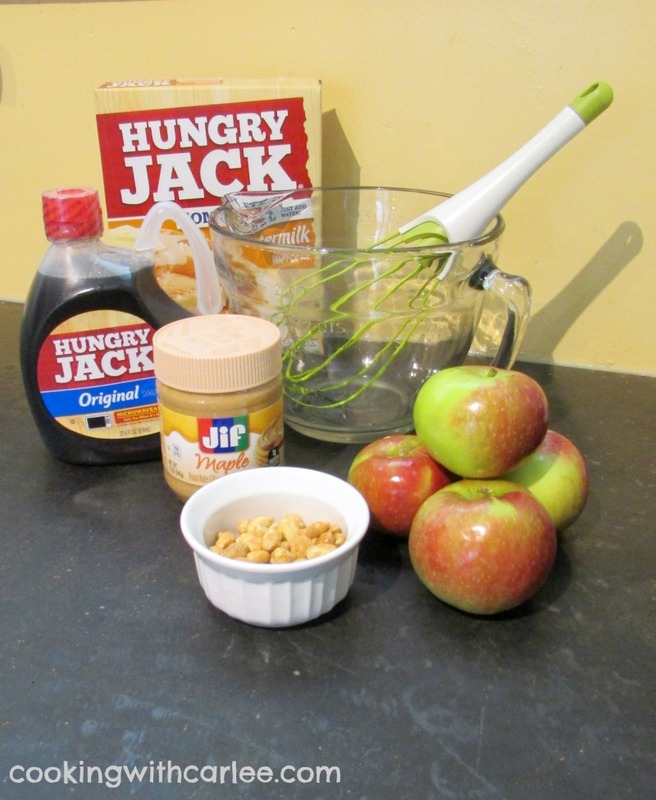 Thanks Carlee for sharing this recipe at Cooking and Crafting with J & J. Breakfast overload! My kids would go crazy. Pinned and shared! Ha! I'm sure they'll love them! Thanks, Quinn! What a neat recipe! Sounds so tasty! Oh my goodness, what a awesome Pancake Pizza! Thanks so much for sharing with us at Full Plate Thursday and have a great weekend! Carlee, I want some! Pinned it. So glad you party with us at Merry Monday and share your scrumptious recipes! I'd happily share! Thank you so much for hosting such a great party! Yum! My kids would love this for breakfast. Thanks for sharing at the Wednesday Showcase!